It is time to get prepared for allergy season. Those irritating symptoms such as sneezing, wheezing, runny nose and itchy, watery eyes due to pollen from trees, grass, flowers, and plants can be dramatically reduced or even eliminated using natural therapies. Allergies are one of the most common conditions where people seek natural treatments. That is because natural therapies do not suppress the symptoms. They provide effective symptom relief while strengthening a person's immune system and decreasing their susceptibility, both short-term and long-term. Limit the use of carpets as they tend to be a breeding ground for dust mites. Bare floors that are vacuumed and damp-mopped frequently is best. Replace your curtains with shades. Dust-mite proof pillow and mattress covers are your first line of defense against dust allergies. It is also helpful to wash bedding, especially pillow cases, more frequently during allergy season. Look into a cool-mist humidifier to lessen nasal congestion and wheezing. On the other hand, if you have a lot of carpets in your home you may actually need a dehumidifier as dust mites love humid environments. A dehumidifier can also prevent mold, another allergen. An air purifier with a Carbon and HEPA filter (high-efficiency particulate air filters) will help to keep the air inside your house healthier. Unfortunately you are better to keep your windows closed, especially on windy days, to minimize the pollen that comes into the house. Limit access of pets to specific areas of the home. It is best to keep them out of your bedroom to ensure that you get a good nights sleep. It can also help to bathe pets frequency as the dander on pets is water-soluble. 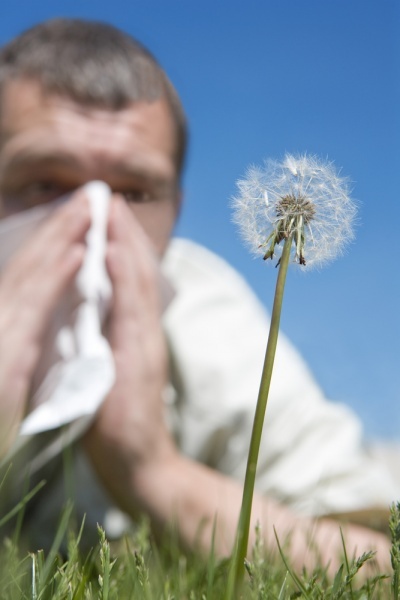 Air pollution can both cause and worsen allergy symptoms. On hot smoggy days it is best to minimize the time you spent outside. It is also best to limit any gardening or outdoor exercise to early morning or cool non-breezy days. Avoid people that smoke. Tobacco is a notorious irritant that increases a person's susceptibility to allergies and worsens existing allergies. When outside choose eyeglasses with side shields to protect your eyes from pollen irritants that are blowing around. If you need to clean out that dusty garage or rake your grass it is best to wear a mask that covers the nose and mouth and to wear goggles to protect the eyes. Nasal lavage is a must for anyone that suffers with congestion and runny nose. Irrigating the nose with a salt water solution often helps to soothe upper respiratory allergies by removing irritants that become lodged in the nose. After you have been outside for awhile it may be beneficial to wash your hair to remove pollen. A hot shower may help as well as it can lessen symptoms like sneezing and congestion. Breathing in steam refreshes and soothes irritated sinuses and decreases the mucous in nasal passages. If your eyes bother you try rinsing them with cool, clean water. Stress is a trigger for many people. If you recognize that stress is your primary trigger you may find that treating the stress directly is as beneficial, or more, than treating the allergies. Insomnia. Sleep is necessary for healing and repair. For some allergies cause insomnia, for others allergies are worse because of insomnia. Ensuring that you get a good night sleep is critical to allergy management. Ensure that you drink adequate water. Water helps thin out the mucous and decreases the feeling of congestion. Eliminate sugar as it suppresses immune function even more. Eliminate dairy as it increase mucous production. Avoiding dairy is critical for anyone who suffers primarily with congestion. Cut out bananas as they are known to increase the production of mucous. Reduce wheat as wheat intolerance is commonly worse in allergy season. Food additives are known to worsen allergies. Most important you want to figure out what foods you reaction to and reduce your consumption of these foods during allergy season. If you are not aware of your food sensitivities than it may be worthwhile to look at doing food sensitivity testing. Peppermint tea has anti-inflammatory and mild anti-bacterial properties. Many people find that it lessens allergy symptoms. A dose or two of horseradish or wasabi can clear the sinuses and increase mucous flow. Honey has been shown to help reduce symptoms. Add it to hot water or other teas. The following supplements and herbs are known to effectively reduce the frequency and severity of allergy symptoms. Vitamin C acts as an antihistamine, which means that it can reduce the severity of allergy reactions. It is most effective when taken prior to the onset of allergies and continued throughout allergy season. Nettle is a wonderful and safe herb for all ages. It is considered a general health tonic as it is high in carotene, vitamin K and quercetin. It is well known as an effective herb for lessening the severity of allergies and for strengthening the immune system. Magnesium is a good choice when allergies affect breathing function. It is also a good muscle relaxant and is known to support many aspects of health. Vitamin D deficiency is associated with increased allergy symptoms. If you are concerned about being deficient it may help to take Vitamin D.
Quercetin is a bioflavonoid with anti-inflammatory properties. It is generally used at the onset of allergy symptoms as it acts similar to an anti-histamine in that it blocks histamine and hence reduces allergy symptoms. Bromelain is known to decrease nasal swelling and it thins mucous. It is effective in cases of sinus infection and congestion. Homeopathic remedies, such as BIO84, Luffeel and Aller-gen can all support the body's ability to prepare for allergy season. They are like the "natural alternative" to over-the-counter allergy medications. They are great to have on hand for when allergies start as many people find them an effective way to lessen allergy symptoms. There are also some great single homeopathic remedies such as allium cepa or euphrasia that are specific for addressing allergies. For those stubborn allergies or if you want to decrease your allergy symptoms in a hurry the following treatments may also be beneficial. Acupuncture is effective in reducing the severity and frequency of allergy symptoms. Intravenous therapies can be helpful for severe allergies or when allergies have exhausted a person. Check out the link on the breathing blog that illustrates a specific breathing technique to clear congestion. Ensuring that you are breathing properly can be one of the easiest and most important factors in allergy management. No one needs to suffer with chronic allergy symptoms. By scheduling an appointment with one of our naturopathic doctors we can help you figure out the best treatment plan for you. It is time to stop suppressing symptoms and actually get a handle on your allergies. Dr. Iva Lloyd is a naturopathic doctor at Naturopathic Foundations with a focus on identifying the true causes of symptoms and diseases and on treating the whole person. Please call the clinic at 905-940-2727 to book an appointment with Dr. Lloyd, ND.